Welcome to JellyRO! 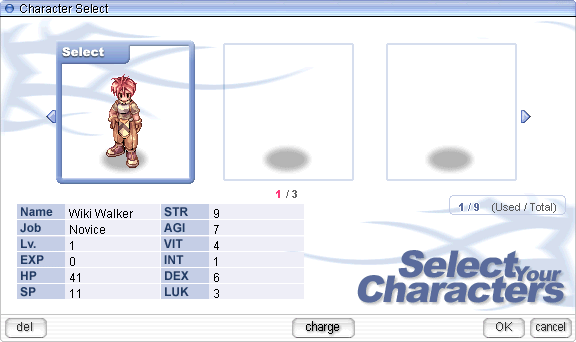 To help the transition of players both new and old to Ragnarok Online, we've provided this helpful start guide with all the information that you'll need to get started in Rune Midgard! Wait! I already know this stuff! When you first log in, you will be presented with a Character Select window. Each square is a placeholder for a character whose information will be displayed below. Click on arrows at the left and right of the character slots or use the keyboard ← and → arrows to scroll through your characters. You may have 9 characters total per account. The numbers below the character boxes (1/3, 2/3 or 3/3) indicate the page number. To create a character, select a character slot and press the Enter key, click on the "make" button, or simply double-click on it. 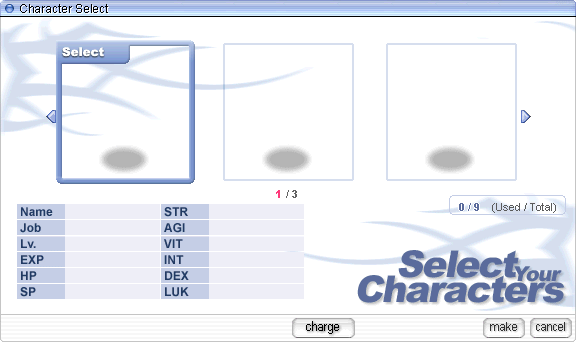 This will bring up the character creation window where you can name your character, customize the character's hairstyle and customize the character's hair color. More hairstyles and hair colors will be available at the Stylist after you enter the game. When choosing a name, be aware of our Rules concerning inappropriate names. Note: You might receive a message that says "Character name already exists." If so, the character creation window will remember the hairstyle you wanted but not your hair color. Make sure the hair color is correct, and try another name. When you are happy with your character, press the Enter key or click on the "OK" button. Once you have successfully created a character, you will see it in the character slot you chose. If you decide you don't like the character anymore, you can press the "del" button at the bottom left and enter your e-mail address to delete the character. Be very careful that you delete the correct character! To log in, simply select the character and press Enter, click on the "OK" button, or just double-click on the character. Upon login, you should appear in the Sky Temple. Take a look around before you head on out! When prompted by the Training Guard, you can either continue on in this map to fight a boss or return to the Training Grounds. As a Novice, you may want to check out Rennard before continuing on to locate an Eden Group Teleport Officer or start a Job Quest in order to obtain a Beginner Weapon. You can ask questions in the Forums or find more information specifically regarding classes on their designated page. 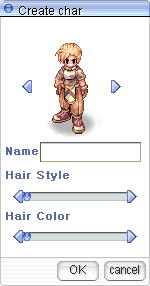 Jobs available to play in Ragnarok Online. For more general gameplay guides, please refer to the Player Guides section. This page was last modified on 15 July 2018, at 23:46.